Are you interested in an introvert? Wondering how to get close to someone who loves to be alone? Often quiet and reserved, introverts may seem like a mysterious bunch. Here’s an enlightening list of dating do’s and don’ts, courtesy of a true-blue introvert. Maureen Marzi Wilson, author of INTROVERT DOODLES, shares her advice on dating. Don’t expect an introvert to get excited about going to a party or bar. Chances are, your introverted date would need to slip outside for frequent breaks. Introverts have a lower tolerance for external stimuli: loud music, bright lights, and crowds quickly become overwhelming. It’s also a good idea to avoid events that require you to introduce your date to large groups of people. You may find that the more people there are, the quieter your date becomes. Introverts prefer a smaller gathering, or spending one-on-one time with their date. This intimacy sparks a connection on a deeper level, which introverts find fulfilling. Plan a date that’s interesting, but low-key. There’s no need to be extravagant. 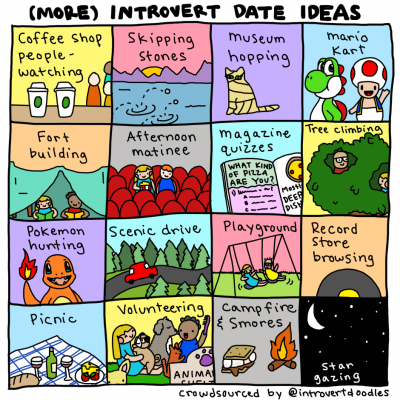 Introverts often appreciate simple outings, like going on a nature walk, sipping coffee in a quiet cafe, or exploring a museum. Many introverts are creative types, and would enjoy making something. Try painting ceramics, building a birdhouse, or making a pizza from scratch. Don’t fill the evening with small talk. Most introverts have little patience for pleasantries with predictable answers. Don’t bother trying to impress an introvert with shallow compliments or a long list of your accomplishments. 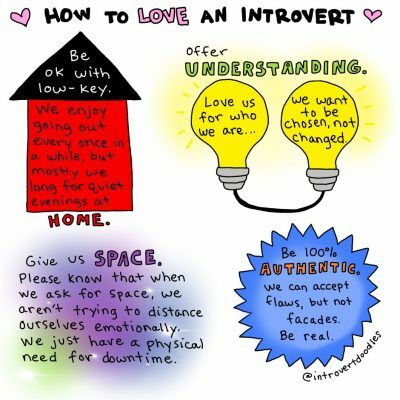 Introverts value authenticity: the more genuine you are, the more comfortable they are. Try asking unexpected questions: “Tell me about a book that changed your life.” “What’s your earliest childhood memory?” “Describe your favorite place.” Introverts are a thoughtful group, and they’ll be more engaged in a conversation that encourages them to think. It’s also okay to have moments of quiet. While some people feel that silent pauses are awkward, introverts often find them peaceful. Sitting quietly beside someone they like is an introvert’s idea of heaven! Don’t plan long, drawn-out dates. You may notice that as the evening progresses, your introverted partner will begin to “wind down.” They suddenly seem more reserved or tired. Socializing is draining for introverts, and solitude is necessary for them to recharge. Don’t take it personally if your date cuts the evening short. It doesn’t mean they didn’t have fun or that they aren’t interested in you. Keep your outings on the short side. Give your date an “easy out” before moving on to another activity. For example, if you’ve just eaten at a restaurant, ask if they would like to watch a movie or if they’d rather take a raincheck. As your relationship progresses, be prepared to give your introverted love interest some space. You may think things are going so well that you’d like to spend every day with them. However, it can be physically and mentally taxing for an introvert to give up their alone time. If they occasionally turn you down, remember, they aren’t rejecting you, they’re merely refueling. Introverts can be slow to warm up, choosing their friends and partners carefully. Although you may initially be puzzled by your introverted love interest, understanding the preferences associated with their temperament is a good start to a promising partnership. 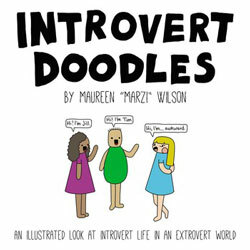 Maureen “Marzi” Wilson is the author of Introvert Doodles: An Illustrated Look at Introverted Life in an Extrovert World. Meet Marzi. She's an introvert who often finds herself in awkward situations. Marzi used to feel strange about her introverted tendencies. Not anymore! Now she knows that there are tons of introverts out there just like her--introverts who enjoy peace and quiet, need time alone to recharge their battery, and who prefer staying in with their pet and a good book to awkward social interactions. Being an introvert in an extrovert world isn't always easy, but it certainly is an adventure. 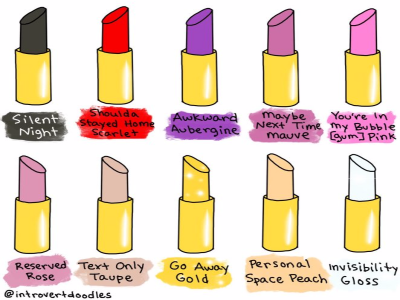 In Introvert Doodles, follow Marzi through all of her most uncomfortable, charming, honest, and hilarious moments that everyone--introvert, extrovert, or somewhere in between--can relate to. Maureen “Marzi” Wilson is a book-loving, pet-cuddling, pizza-eating introvert, living a quiet existence in the mountains. 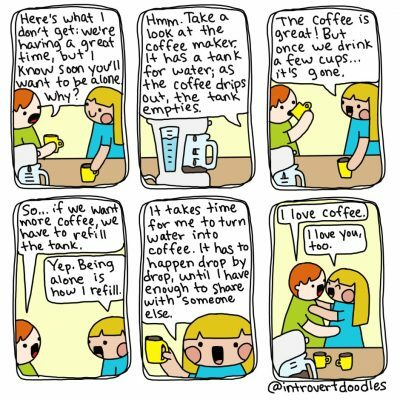 She’s the artist behind IntrovertDoodles.com, a comic series that explores the joys and challenges of introversion.